Does this creature look dangerous? Just in case she/he is sooo well camouflaged (not!) that you can't see her, I'll blow it up a little. Yes, there. See this dangerous beast? 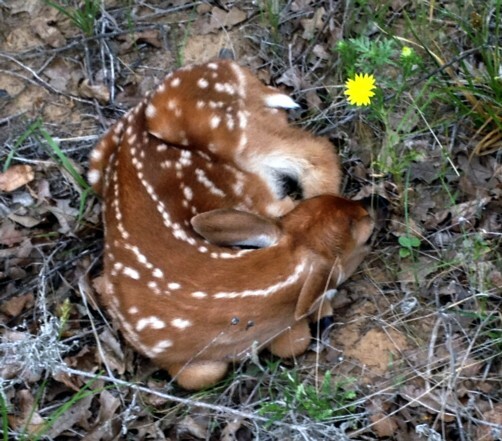 Mother deer put their babies down and tell them to "stay here until I get back." Apparently deer are much better behaved than children and dogs. 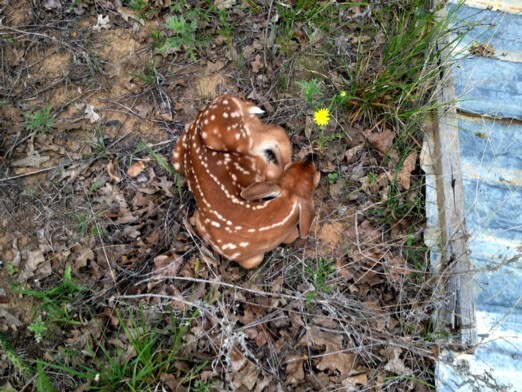 This fawn's mother (big thinker) had put her in the perfect place - at the base of a deer blind. Yes, a deer blind! Out in the open! Friends and Neighbors, she did NOT blend. Which might have been the point. Perhaps her mother was 49 and prone to forgetting where she put things. I could certainly understand that! Just sayin'. So we kept a loose eye on her/him hoping that Mom would come get her baby before the coyotes found it. Fotunately she did. So why do I consider this to be a dangerous beast? Well let me tell ya! You see, we saw this little rascal a few weeks ago and were reminded that most baby deer WILL NOT move if Momma tells them not to. Therefore, when mowing the roadways in the forest, Blue Heeler and I went ahead of the tractor on a 4wheeler to make sure we wouldn't mow over any baby deer. Keep in mind that I zoom up and down these roads ALL THE TIME on that 4wheeler. In fact, on this particular morning, a few hours earlier, I had zoomed down this path 3 different times. 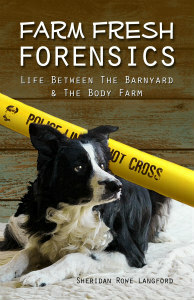 And so it was, no one was more surprised than me (and maybe Blue Heeler!) when I ran over a limb measuring somewhere around 4-5 inches in diameter and several feet long, that jumped up and whacked me in the elbow! LIKE A FREAKIN' BASEBALL BAT!!! I kid you not, it was like I was just slowly cruising down the path, when a baby deer with a baseball bat smacked the crap out of me! I was vaguely aware of the front left tire rolling over it a moment before impact. Then there was a lot of cussing. And gasping. Blue Heeler did a lot of gasping, since if my arm hadn't blocked the blow, he would have gotten a baseball bat to the snout. I was certain it was broken. The elbow swelled immediately. Then again, since my fingers still worked, I decided it wasn't that bad. It swelled to the point that I couldn't bend my arm enough to brush my hair, or clean the red dirt out of my nose! (Sorry! TMI!) Still, I considered myself lucky. Not only is a broken arm inconvenient, but I can not AFFORD a broken arm! Frankly, who can? So we resorted to veterinary medicine again. After all, what's good for the horse is good for the human! The elbow is still sore, just like the foot the damned cows stomped on earlier. (same side too) Did I tell you about that? I'm not sure if I did or not, but the damned cows stomped all over my left foot, thus leaving me hobbling and wondering about broken bones and the wisdom of having cows. For we all know that regarding cows, anything that big and that stupid can be dangerous, but who figured this little critter for dangerous? Until Bambi runs out of the woods with a baseball bat!